After four years in hibernation it was feared that the beast from the east would not emerge again. No sighting were reported on the leg down to Taunton. But from then on the beast began to stir! It whipped up some of the worst weather seen in months and crinkled the terrain into non stop series of steep climbs and vertical brake gripping descents. Yep the beast was back! That morning at 6am 62 cheery riders started the event in Waltham Abbey, including the Costa Rican National Mixed tandem team. Along the route Tracey and Diane Horsman provided the riders with a very welcome brekky at the top of Streately Hill. Riders then continued across Salisbury plain and Somerset until reaching the turn at Taunton Dean Services. 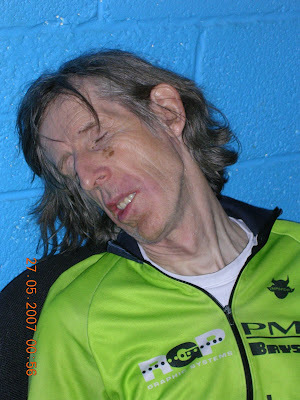 The next major Willesden Control was at Yeovil where riders could get some proper sleep. The first riders were not expected there until 11pm that evening, so the support crew were most surprised by the leading group of six riders who appeared just after 9pm. They were on a flyer and looked as fresh as daisies! They were followed about 30 minutes later by Martin Lucas with Steve Ayres and Darlene Rini (both doing their very first 600), again in a highly creditable time. The remainder of the field then arrived over the next four to five hours. In the early hours of Sunday morning the rain arrived and continued to arrive by the cloud full during the rest of the day. The conditions saw 25% of the riders pack as the weather began to verge on the dangerous. Tracey and Dianne’s second field kitchen was established at the Middle Wallop Army museum, where hot food and sympathy was being dispensed in equal quantities. Back at Waltham Abbey the first riders were home by noon and the rest followed in over the remainder of the day. Every one of them a hero! Conditions on the event, plus the 5,000 metres of climbing, made it one of the most difficult and arduous audax events to be held in the country. I suspect Mark Brooking is thrilled! The Beast from the East??? ?